Originally published under the title, "Israel Doesn't Owe Trump Much for Finally Moving the Embassy to Jerusalem." Ever since Donald Trump recognized Jerusalem as Israel's capital last December, Israelis have been told to brace themselves for a hefty quid pro quo under his long-awaited peace plan. 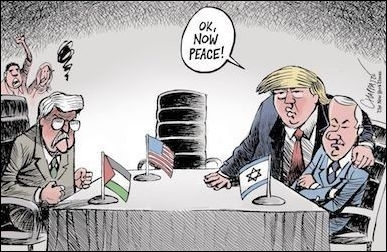 "You won one point, and you'll give up some points later on in the negotiation," the president told Israeli Prime Minister Benjamin Netanyahu at a joint news conference in January. Last month, he explained that Israel will pay "a higher price" because the U.S. moved its embassy to West Jerusalem on his watch — and that the Palestinians will "get something very good, because it's their turn next." His envoys put it less crudely. With Trump's most recent comments having sparked vows to "push back against dictates or pressure" within Netanyahu's own cabinet, U.S. Ambassador to Israel David Friedman said on September 7, when asked for the umpteenth time what "higher price" means, "(S)ince the U.S. began this with a very good faith effort in Israel's direction, the hope is that Israel will take that into account and reciprocate with the same level of good faith that it received." Israelis have been told to brace themselves for a hefty quid pro quo under Trump's long-awaited peace plan. The price is Israeli acceptance of a yet-to-be-revealed peace plan reported to recognize, in some form or another, the capital of a future Palestinian state in one or more neighbourhoods and suburbs of East Jerusalem (Jebl Mukaber, Isawiya, Shuafat and Abu Dis), from which Israel would be expected to withdraw, in exchange for the Palestinians yielding the so-called "right of return" to Israeli territory by descendants of those made refugees in 1948-49. It also provides for massive economic assistance to the Palestinians. The Trump administration is insistent that Israel accept the plan upon its unveiling, not because the brainchild of Jared Kushner has a prayer of restarting the Israeli-Palestinian peace process, but because Trump wants to appease Arab states that have demanded a quid pro quo for his recognition of Israeli claims in Jerusalem. Trump wants to appease Arab states that have demanded a quid pro quo for his recognition of Israeli claims in Jerusalem. Even if the Palestinians reject the plan (as will surely be the case), conditional American and Israeli acceptance of a divided Jerusalem would be more far-reaching a concession than Trump's mere acknowledgement of a capital already in existence for seven decades. Though Israeli opposition leader Yair Lapid predicts that "it's going to be very difficult for Netanyahu's government to say no to President Trump," it shouldn't be, for several reasons. For starters, Trump's formal recognition of Israel's capital was unsolicited. Although Israeli officials have been routinely urging it for years, it was not at the top of their immediate wish list — among other things, for fear that it would disrupt the recent gravitation of Sunni Arab governments toward Israel or open the way for reciprocal recognition of Palestinian claims in Jerusalem by the next Democratic administration (the book is still out on both). Indeed, Israel wasn't really even the intended beneficiary of the gift. For Trump, moving the U.S. embassy had more to do with American evangelicals and the producers at Fox News (his cheat sheet on what evangelicals want) than with Israel, for which he has shown little personal affinity. Israelis were forced to endure a dedication ceremony featuring controversial American megachurch preachers Robert Jeffress (who declared in 2012 that president Barack Obama was "paving the way for the future reign of the Antichrist") and John Hagee (who suggested in 2014 that Ebola outbreaks and economic problems in the U.S. resulted from God's wrath on Obama) and boycotted by most of the civilized world. No Democrats were invited (setting up Ambassador Friedman to then complain that none attended). All in all, this worked out well for Israel, but that doesn't put it on the hook for appeasing everyone who was upset by the affair. It would be the height of folly for Netanyahu to accept a proposal he would otherwise firmly reject merely to settle accounts with one man. At the end of the day, Trump's "gift" was made by an idiosyncratic, one-off president who has conducted Mideast policy through ad hoc channels circumventing the foreign policy establishment and is near-certain to be out of office within three years. Whatever debt Netanyahu has incurred to Trump (or vice versa), it won't roll over to future administrations. It would be the height of folly for Israel's prime minister to accept a proposal he would otherwise firmly reject merely to settle accounts with one man.